First Fridays is about sharing knowledge and bringing the community together. It is a FREE event series that invites the Oceanic arts community to come together once a month, with creative presentations and performances. 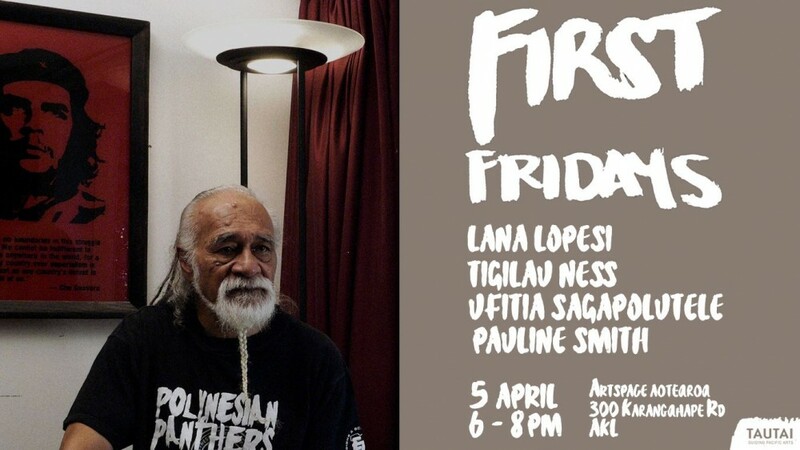 This event is organised by Tautai Pacific Arts Trust and hosted at Artspace Aotearoa. Lana Lopesi is an author and critic based in Tāmaki Makaurau, Aotearoa. Lana is the Editor-in-Chief for The Pantograph Punch and author of False Divides (2018). Previously Lana was Founding Editor of #500words and Editor of Design Assembly. Lana’s writing has featured in a number of publications in print and online as well as in numerous artist and exhibition catalogues. Lana also served as a judge for the Best Writing by a NZ Māori or Pacific Islander category for the Art Association of Australia and New Zealand awards. She is also part of a global Indigenous curatorium who first formed to curate the exhibition The Commute at the Institute of Modern Art, Brisbane (2018) with the current exhibition Layover open at Artspace Aotearoa (2019) followed by Transits and Returns at Vancouver Art Gallery opening in September this year. Tigilau Ness is a proud Niuean, and is a renowed activist, songwriter, storyteller and community worker. His activist nature presented at an early age, with being expelled from Mt Albert Grammar for refusing to cut his hair; and joining the Polynesian Panthers at 17. With the Panthers he held the positions of Minister of Culture and Minister of Fine Arts. He was also active in protest movements, notably Bastion Point and the 1981 Springbok Tour. His community work is extensive, from supporting Niuean groups and mentoring up and coming musicians; to teaching young men parenting skills and advisory work in the arts sector. Through his songs, Tigilau and his band Unity Pacific, have been able to share important stories and political messages. Given the depth of his life story and experiences, Tigilau has been featured in several documentaries. Pauline (Vaeluaga) Smith is an author and educationalist. Born in 1963 in the small rural Southland town of Mataura, Pauline's heritage is Samoan, Tuvaluan, Scottish and Irish. She has been a classroom teacher, university lecturer, events manager and is the Director of the Murihiku Māori and Pasifika Cultural Trust. Smith's first book My New Zealand Story: Dawn Raid, was a finalist at the New Zealand Book Awards for Children and Young People in the Esther Glen, Junior Fiction and Best First Book categories. It was the winner of the Best First Book for 2018. Ufitia was a shining star of the Pasifika Internship Programme 2018, funded by Creative New Zealand and proudly delivered by Tautai. She completed her internship with Dance Aotearoa New Zealand (DANZ) as a way to learn valuable skills in arts management. Ufitia was capped recently with a Masters of Dance Studies degree from the Faculty of Creative Arts and Industries at the University of Auckland. Her research entitled Teine Samoa | Teine Niu Sila – Being a New Zealand-born Samoan woman, navigating cultural identity and loss in the 21st century: A Hybrid Choreographic Exploration, focused on the integration of her culture and practice and how the two form personal identity. April's First Friday event will be hosted by one of the 'Layover's' curators, Lana Lopesi. 'Layover' includes work from BC Collective (Ngāpuhi, Tainui, Alofi, Liku, Lakota Sioux) with Louisa Afoa (Sāmoa) and Edith Amituanai (Sāmoa). The exhibition 'Layover', uses the idea of being-in-motion as a tool to discuss the complex ways in which culture moves physically, spatially and over time. Many thanks to the exhibiting artists and Artspace Aotearoa for agreeing to host this months First Fridays. The event will be live streamed to Facebook on the night.